**You can watch everything posted below on the Flashback Feeds, which comes with your live feeds monthly pass! Jessie said that she doesn't wanna start campaigning against Spencer because it could backfire on her & he could start talking crap about her. Aaryn (who will be voting Jessie out) tells Jessie that she "feels" like something is up & that she feels like she's "being left out of something". Jessie: "Don't let them push you around." Elissa/GM do yoga together in the backyard. They're talking about upcoming HOH's and who should go when, who they feel would be good for their game if others won HOH. Aaryn is in the HOH room now. Amanda mentions how Jessie told them earlier that "congrats on making final 8" and how they didn't say anything back. Amanda: "I was like thaaaanks." McCrae tells Aaryn she's gonna need to get closer to GM to make sure they're safe. 3AM Alliance (Aaryn/Andy/McCrae/Amanda) are still talking in the HOH room. Amanda: (to Aaryn) "You could convince GM to put up Helen though, right?" Aaryn: "We could convince GM to do anything, there's just a (certain way you have to approach her)." Amanda goes on to say that she still thinks Judd as MVP and would've taken Andy to Final 2. Amanda/McCrae wanna take Aaryn to Final 4 as planned, but they're worried that Aaryn would win to Final 2/3 because of how good at comps she is. They think maybe they could take Elissa instead. Andy (who has a Final 2 deal with Aaryn) said he'd rather take Aaryn to Final 4 because he knows McCrae/Amanda would take each other and that would mean he'd go out Final 3/Final 4. Amanda/McCrae/Andy can hear noises coming from the room that is used for Pandora's Box. McCrae: "It's for Pandora's Box, that's what I'm guessing." Amanda: "You're gonna get pandora's box.."
McCrae: "And it makes sense that they'd set that up today." Andy: "I'm sure the waters will get rougher, but like, everything I wanted to happen, has happened." 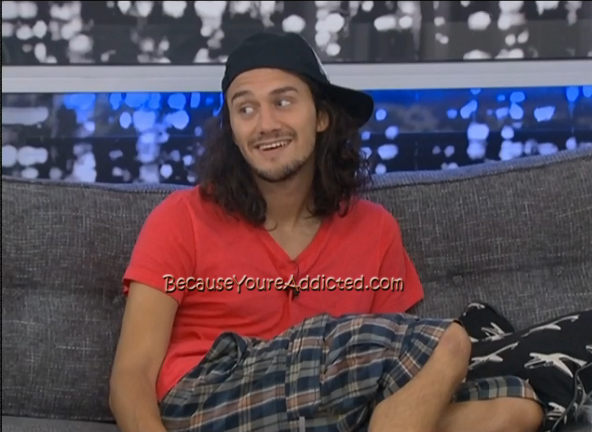 McCrae: "Yea it's been smooth sailing up to this point." Amanda: "It's only gonna get easier & easier because we have the votes." Andy: "I think poopy (Aaryn's nickname) will stay around for awhile." The girls are talking about jury house & what Candice/Judd are probably doing right now. Helen: "Candice is probably napping, and Judd is probably smoking too many cigarettes. The jury house is gonna be a circus, I cannot even imagine." Helen: "I think a lot of people have said stuff in this house (that wasn't nice)." Elissa: "The way they treated Candice, there's just no excuse." Elissa said the comment that GM made to Candice (about her mom/moms) broke her heart. Helen said she loves Candice, but feels that it was in "poor judgement" about calling GM out on tv. HG's are either still napping or in the backyard talking. Current topic is about Spencer's megaphone. **Okay guys & gals, I'll be back in the morning with The Overnighter! :D Until then, enjoy the live feeds!!! I wonder if this final 3 between Helen, Andy and McRae is real. This is the worst season ever, I am done with BB15. Andy is the lamest player ever and the mean girls are just the worst. Helen is dillusional and the only ones I even can tolerate are Jesse and Elissa. What a waste of my time this season. Why they didn't get rid of Amanda when they had the chance I will never know. Can't wait until Amanda finds out it was America who wanted her out. Buh Bye now. Here's a link to a 30 sec teaser vid of ep 7 of Wil's BB 15 The Saga. He says this upcoming ep is his favorite so far. Dan: Every game is "the worst season ever" until the next season. But literally, nobody's forcing your eyes to be glued to the television screen. around 9:15pm BBT Andy/Amanda mentioned DR wants them to say things that aren't happening, because they don't have material. Amanda feels like the show is making things up because the week has been boring. Andy agrees, says he feels like they are stretching for material. The show apparently told Andy something like you win HOH and it gets boring. Amanda said next week's plan, production is trying to incorporate into this week's plan, like "Why would you give Helen the veto if you want to backdoor her?" Amanda said well because it's not this week. Andy said they were like, "Tell us how the tides are changing and Spencer might go," even though they're not. Amanda wants production to just tell her what they want her to say. Pretty disgusted by Helen's comments regarding Candice! So her being completely ostracized in the house was ok?! She's gotta be kidding me. It amazes me that people's biases prevent them from having an ounce of empathy for that girl. It's always the black woman's fault for how she's treated. God forbid she stands up for herself; must mean she's angry smh. Wow Helen. I still like McCrae but I think he needs to dump Amanda already. As for the others only Jessie and Elissa are tolerable. Andy is a sneaky snake, Amanda, Aaryn, and Gina Marie are very mean spirited I don't like that at all. I used to like Helen but she doesn't play well she shows her cards to too many people and that is gonna hurt her game in the end... She can't see that Andy is not loyal to her. A nd then there is Spencer he just goes with the flow now and hopes for the best. He has no power and no true ties to the others he is disposable to them. i have been following this blog for a few seasons now and one thing I've noticed is that every season "is the worst season ever", with people promising not to watch any more. So this season is no different. But I'll bet you'll remember this cast. Very memorable people that make it easy for you to feel very superior to. This is kinda late, but did they not show Andy getting his hoh or read his letter? I can't fault Andy this week, he is in the middle of the two powers in the house. By avoiding their manipulation he keeps the target off of himself and will be in a good position to go final 3 with the side that emerges victorious. If he makes final 2 then he has a HOH and Veto victory in his resume. I think Aaryn is the wild-card. She seems to be the favorite to win any competition. If she lays low and doesn't win for awhile she might sneak into the end game and win out. If memory serves me correctly if you are HOH final 4 you still get to compete in the final HOH. Right? If she takes GM she could win. At this point she needs to NOT win because she will be forced into a power move she doesn't want to make. I think the nominations will continue to be floaters and we will just have to wait for a veto ceremony back door of Helen, Amanda, or McCrae. Although I can see a scenario where Helen masterminds a backdoor of Aaryn. Because no one wants to do the dirty work I can see a GM or Spencer HOH this week and a lot of behind the scenes work for a back door. For myself I am enjoying the game this season. I think the MVP really messed things up. I would have liked to see how Nick's game would be at this point. The twist caused a whole lot of game play to happen way to fast, and McCrae's defection from the moving company ( along with Jeremy's egocentric mastermind complex... what if he had just worked behind the scenes communicating with the moving company instead of telling them what to do.. ) set this house alliance in motion. I don't care much for Amanda's game play at this point, but she is the best in the Diary room. I agree that she is casting gold. I completly agree. This seasons HG are ALL followers. Cant wait for GM n her bestie to realize how their awful ways have affected them outside the house. As for Amanda....cant wait until she is evicted! I fully agree...all of these players are terrible and mean! I cant wait for GM n her "bestie" to see how their ugly ways has affected them outside if the house. As for Amanda....she us nothing but a bully!